Some show specials that you may want to take advantage of @ ourExpo this weekend. SA Fly Line Trade-In: Time to replace those fly lines? Get $20 off a newMastery line for each used (in any condition) line you trade in. Only one line can be traded in per new fly line purchased. Umpqua Pack Program: Purchase a new Umpqua pack at the event and receive a free UPG Flybox from Umpqua. Buff: Buy 2 Buffs and get 25% off. 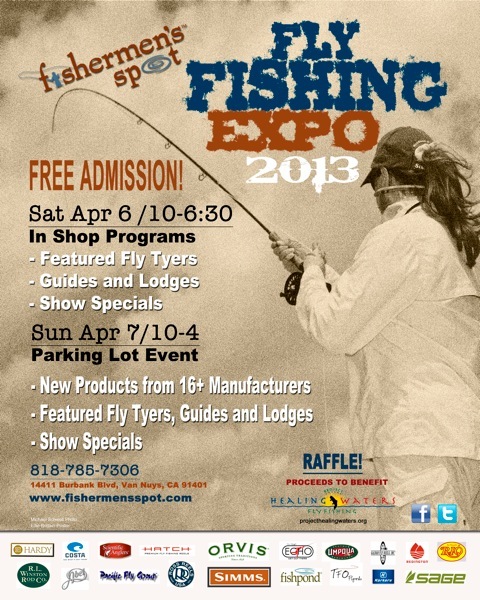 Pacific Fly Group: Be sure to stop the PFG booth and restock your fly box. Super quality flies for just $12/DZ. Rio Fly Line: Free 3 pack of Rio Leaders with purchase of Rio Fly Line. Sage: Free Rio Fly Line with purchase of a Sage rod. Winston: Buy a Winston “Green” rod and have your name inscribed on the rod free of charge. Look for other show specials throughout the Expo. Bring your $25 off $100 purchase coupon (on regular priced items) or, if making a large purchase, take advantage of our “We pay the Tax” (on regular priced merchandise only) offer. Here is the presentation schedule for the April 6-7th Fishermen's Spot event. We hope you will join us both days to take in some of these great presentations. On Sunday April 7 we will have manufacturer’s reps on hand from over 20 major fly fishing brands so that you can see for yourself what’s available. Enjoy! 9:30AM: - "Fly Fishing the Surf" Local surf guide Jeff Priest is the man to get you started or up your game in the surf. When, where, and how to get going in this fun fishery that is so close to home. 11:00AM - "Fishing Missouri River Hatches, Montana" Jason Newmack from The Lodge at Eagle Rock. The Missouri River has amazing hatches and Jason Newmack will help sort out what flies and when. 12:30PM - "Carp Fishing in Southern California" Conway Bowman host of Fly Fishing the World. Conway has fished all over the globe for many exotic species but he still loves to carp fish right here in So Cal. So much so that he also hosts the annual Carp Throw Down on Lake Henshaw. Find out more about this great gamefish. 2 :00PM - "Seasons on the San Juan River, New Mexico" Chris Taylor from Fishheads of the San Juan River Lodge. Chris and his guides are masters on the mighty San Juan. Flies, gear and techniques will be discussed in this informative presentation. 3:30PM - "Dry Fly Fishing the Yellowstone Region" Nelson Ishiyama from Henry's Fork Lodge> Nelson has fished the Yellowstone region for over 40 years. His knowledge of the area’s dry fly fishing is unsurpassed. 5:00PM - "The Calico Syndicate" The Movie and Kona Beer. Learn from the Calico masters about patterns and techniques for this uniquely So Cal game fish. The guys will be sharing a 17 minute trailer of their great movie which will be on the shelves this summer. Since the boys are sponsored by Kona Brewing Company they decided to bring some ice cold Longboard Lager to share too. 10:00AM - "Secrets for Success in the Eastern Sierra" David D' Beaupre from Sierra Trout Magnet. Season is almost upon us and David will give you the tools to get off to a great start for the new trout year. 11:30AM - "Salmon, Steelhead and Trout in Small Streams, Sitka, Alaska" from Tad Kisaka of Classic Casting Adventures. Fishing small, wild, intimate, rivers for bright sea run Steelhead and Salmon is a passion for Tad Kisaka. Learn how affordable and accessible this fishery can be. 1:00PM - "East Cape Big Game, Baja, California" Jeff deBrown from The Reel Baja. Jeff is an expert on the many species that inhabit the waters of Baja. Want to chase Roosterfish on the beach, tease sailfish to the fly or pull on Yellowfin Tuna? Jeff is the man. 2:30PM - "Fly Fishing the California Delta" John Sherman from Simms. You have seen John’s photos on the cover of many fly fishing magazines and his home, literally on the banks of the Delta ensure a superb presentation on the awesome fishery. Any questions please feel free to call the shop.